The aim of this program is to let robot push box, which is placed in an irregular room, to side of the room. The black parts are obstacles. The task is considered accomplished when any part of box touched wall. The main part of interface will be explained in following paragraphs. which robot is placed, the red square is the box that will be pushed by robot. The best individual’s program, which generated by GP. Box position: to setup initial coordinate of box. Box size: to setup box’s size. Trajectory: to select whether the trajectory should be drawn or not. Delay: Set this number to decide delay-time between two steps of robot. Elitism Rate: setup the rate of directly copy elitist individual to next generation. Mutation rate: setup the probability of mutataion. Robot total step: setup the total steps of robot in one running. Depth of Gene: setup the initial depth of individual’s gene. Max Depth of Gene: setup the maximum depth. 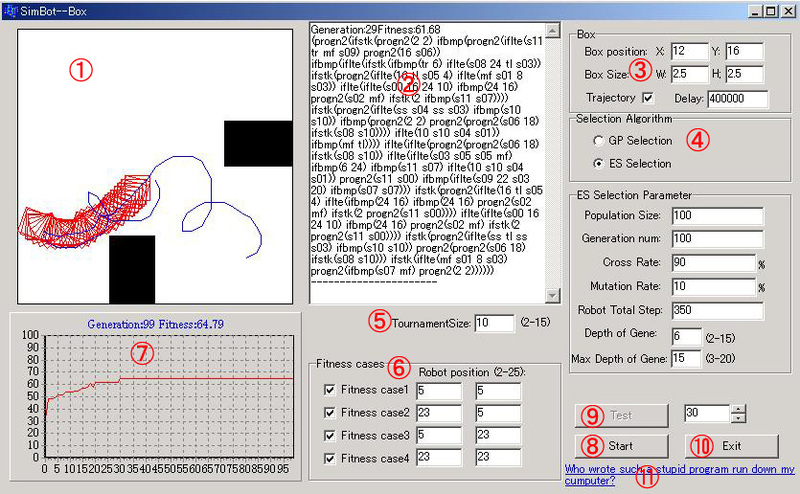 This program used Tournament algorithm to select parent from individuals, set the size of tournament in this edit box. Fitness of this program is defined as the minimum distance from box to wall. We defined fitness cases as the fitness that according to different positions of robot. In this program, we set 4 fitness cases. The position of each fitness case can be set here, and user also can select whether each fitness case will be used or not by checking the checkbox of it. Note that if you did not check any of them, the program will not run correctly. The fitness of each individual is the sum of selected fitness cases, here the x-axis is number of generations y-axis is fitness. The test button, after evolution, you can see the result of each generation by pressing this button. Just to select generation number by input number in the edit-box and press this button, the robot will run according the code, which is shown in part 2.
to show the about box. Robot rushes into obstacles occasionally due to error of calculation. Robot will run until reached generation number even if it has accomplished the task. When program running, it can not response to user’s input. This can be solved by using the technique of multi-thread. Copyright © 2002-2019 Iba & Hasegawa Lab., University of Tokyo, All Rights Reserved.